KAMPALA– The decision by Uganda Police to detain politicians in their homes and or arrest them has been slammed by some Legislators, arguing that no politician has instigated Ugandans to demonstrate. On Thursday some politicians who include FDC former president Kizza Besigye, Lord Mayor Elias Lukwago, Medard Ssegoona, Ingrid Turinawe and Allan Ssewanyana woke up to the news of the deployment of Police in their homes in a move aimed at restraining them from attending court proceeding of jailed Kyadondo East MP, Robert Kyagulanyi also known as Bobi Wine. Although, Police’s attempt to block Kyagulanyi’s lawyer, Ssegoona from representing his client in Gulu Court Martial were futile as he hadn’t spent a night at his home. Amongst these politicians, it was Dr.Besigye who was whisked off to Nagalama Police station in Mukono on an attempt to move out of his house. He spent the whole day at the police station on charges of Preventive Arrest . He was however later driven back to his home in the night and is supposed to appear at Kasangati Police Post on 28th August. Now, Mathias Mpuuga, the Masaka Municipality MP has spoken out on Police describing the Force’s decisions as an act of cowardice. 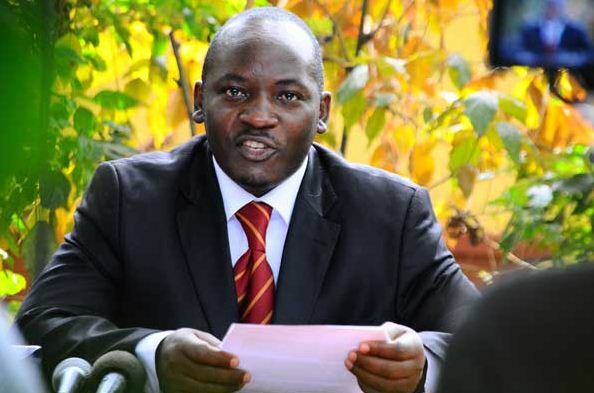 “They fear that these people will call on Ugandans to demonstrate but that is empty because Ugandans don’t need MPs to call them upon to demonstrate if they are set out to do so,” Mpuuga said. He pointed out riots that occurred on Monday saying the voters didn’t need any encouragement like in Jinja East where its MP Paul Mwiru isn’t there, in Mityana, Francis Zaake remains stuck in Rubaga hospital fighting for his life. “Ugandans will still demonstrate whether they are encouraged or not, so the men of uniform who are spending cold nights camped at homes of these MPs should go back home and enjoy their sleep because they are simply wasting their time because the MPs are many, compared to the millions of Ugandans who are yearning for change,” said Mpuuga. “If people want to demonstrate, they can always do it without being incited, motivated because Ugandans are sober, they know what they want, they will go for it. So I don’t think that an attempt to block their leaders will stop the resolve of Ugandans of the change they desire,” he added..
Andrew Aja, Leader of Independent MPs called on Government to listen to voices of people chanting ‘People Power’ as these are the people who want to feel they own this country themselves.